I can't believe this is the last Friday in September. September is always super busy and this year was no exception! It seems like we are always booked to do something which is fun, but also exhausting. I hit my third trimester this week and I am really feeling it. I wasn't able to keep my eyes open and I felt quite queasy this week. I didn't get my intended blog post done this week, but I really felt like it was more important to listen to my body and hit the hay early this week. I am linking up with the lovely ladies from H54F to share the highlights from my week. To catch all the H54F goodness make sure you check out Della, Katie, Tif, and Becky. 1.) I had a fantastic party on Saturday. Family and a few friends came to celebrate my 30th birthday with me and I had such a wonderful time! Hubby had ordered me a fabulous cake for my birthday and it turned out so well! 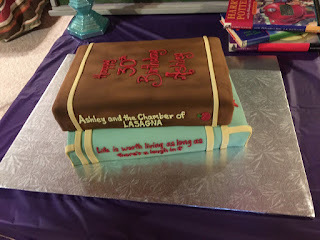 I had a book themed party and I was so happy to have everyone with me to celebrate. 2.) I had a hair treatment on Friday and it felt so good! At one point my stylist was called away to deal with a situation. She asked me if it was okay that she was just going to leave me to "relax at the sink" for a few minutes. Ummmmmmm... yes! I am pregnant and I have a 3 year old. I take any chance that I get to relax. I nearly fell asleep. Ha ha! 3.) Despite feeling unwell this week, work went well. Everything ran relatively smoothly so that is always nice. 4.) We were invited for cake one night to celebrate a friend's birthday. Oh my goodness. The cake was so delicious! We had a fun time and our kiddos had a blast playing with one another. 5.) My parents gave me some birthday money for my gift. I used the money to replace my coffee maker. My coffee maker cratered four months ago and I was trying my best to get by without one until January. My fatigue and the birthday money helped me change my mind, so I bought a new one this week. I have to say... it makes delicious coffee. I missed having a coffee maker more than I realized! How was your week? I hope you all have a fabulous weekend! Your cake is so awesome!!! I hope you start feeling better soon, Ashley! Thanks! I am starting to feel better!